Sgt. 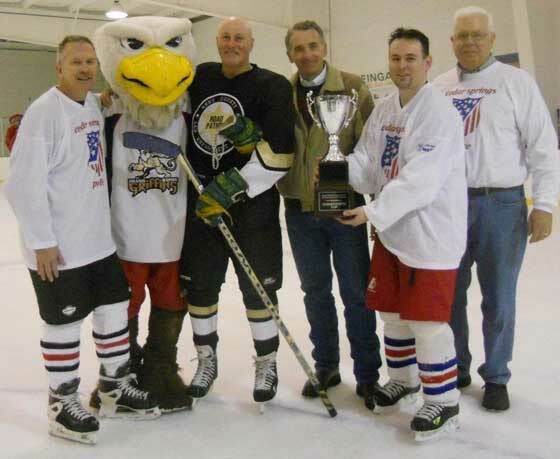 Ed Good, Griff, Lt. Jack Stewart, Sheriff Larry Stelma, DPW Director Roger Belknap and Chief Roger Parent at the Hockey and broomball fundraiser for the library last Saturday. 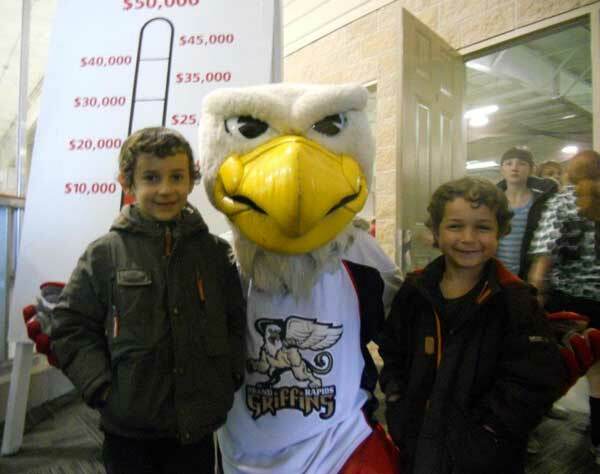 There was a little something for everyone Saturday at the hockey and broomball library fundraiser, even if you weren’t a hockey fan. Burns said final figures aren’t in yet, but she thinks the final tally will be about $2,000 to go toward the library matching grant fund. The Cedar Springs Police, guided by Team Captain Ed Good, beat the Kent County Law Enforcement team in a shootout 5 to 4. 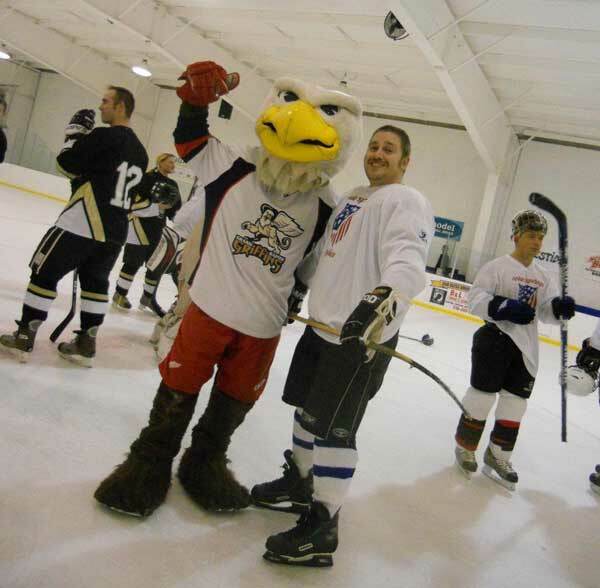 Andy Good scored 2 goals in regulation and had the final tally in the shootout to ice the game for the Cedar Springs Police. 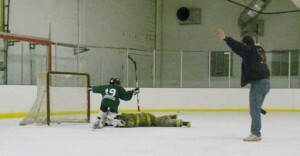 Bill Kelly scored a goal and added a shootout goal for the KCLE Team. 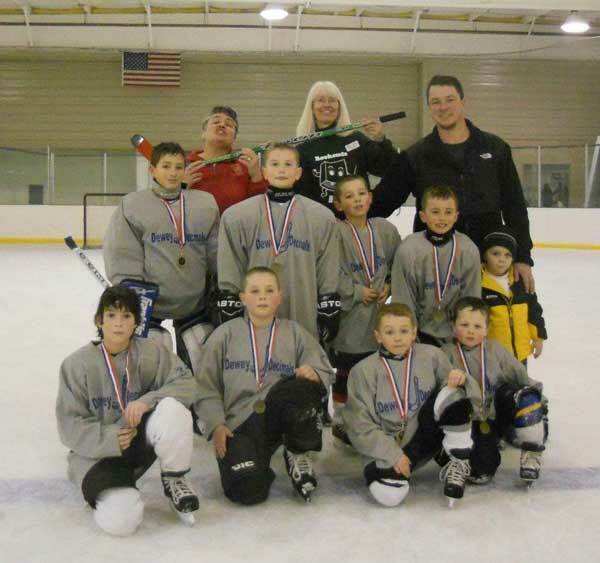 It was a family effort for KCLE Team Captain Jack Stewart who had sons, nephews, and a niece suit up with KCLE team. The Cedar Springs Team also had some father-son combinations in the lineup to make the game special. The Squirts take on Officer Paul Feutz in shootout action. The Dewey Decimals beat the Bookends. The Guns and Hoses beat the Bureaucrats, but reports are that there were a number of questionable calls by officials Dave Barnes of the Cedar Springs Fire Department and Sgt. Ed Good, CSPD, and that the score keeper (Deputy Chief Marty Fraser) was biased. The Sweep Potatoes and Frozen stiff ended in a tie, even after a shoot-out. Burns had some compliments of her own. “Both Ed (Good) and Roger (Belknap) did an amazing job with this event, from pulling the rosters together to designing the logos on all of the jerseys,” she said. There are still some long-sleeved t-shirts for sale, and they can be purchased at the Cedar Springs Library for $18. RCTV filmed the KCLE vs. CS Police hockey game and you can find it at www.mhsaa.tv/rockford/events/30309.